It would be an understatement to say that Assassin’s Creed Origins is one of the biggest games coming this October. And there’s no doubt that expectations are sky-high for Ubisoft’s upcoming game, the first major Assassin’s Creed entry since 2015’s half-baked but serviceable Assassin’s Creed Syndicate. And the upcoming Assassin’s Creed Origins does look like it could end up being something special when it hits shelves this Friday, in no small part thanks to its ancient Egyptian setting and the fact it serves up an origin story which explains how the self-righteous Assassin Brotherhood came to be. Hopefully, the game’s story will be a cut above that of last year’s film adaptation then, while the game also boasts several gameplay innovations which might even make this the best Assassin’s Creed game since 2009’s much-loved Assassin’s Creed II. There’s not much longer wait in order to find out whether this latest entry in Ubisoft’s world-conquering series is up to scratch, and Ubisoft has not released a launch trailer for the game, which amongst other things showcases Origins’ combat and story. Thankfully this Assassin’s Creed features an overhauled combat system which should make slicing and dicing enemies more satisfying than in previous Assassin’s Creeds. 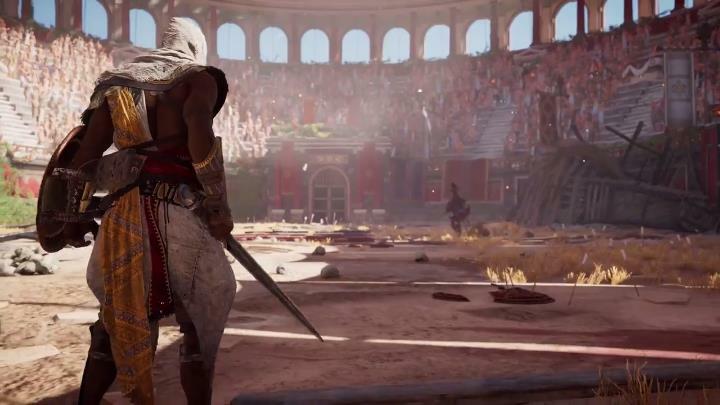 And in the trailer below we see protagonist Bayek doing just that, while it’s great to know this will be featuring brutal gladiatorial combat and even one on one fights against Egyptian gods (the latter being part of the free content Ubisoft plans to release for the game post-launch). There’s also naval combat in this one as can be seen in the trailer, which is not so surprising taking into account that the team behind Assassin’s Creed IV: Black Flag is behind this latest Assassin’s Creed outing. Also, it will be great to see how the Assassins got started, and what role protagonist Bayek and other historical characters like Cleopatra (whom you will be taking missions from in the game) play in the founding of the famous Brotherhood of assassins. All things considered, this is one game Assassin’s Creed fans won’t want to miss, so stay tuned to this website for a review and more coverage of Assassin’s Creed Origins in the weeks to come.